Twitter may be a scary place for new users; you may ask, why do I need a Twitter account when I already have a Facebook? Well if you’re looking to find information quicker than any social media platform, share your thoughts, ideas and opinions on social issues with 140 characters at a time, then you should get started. Let’s not forget if you have a business or involved with a business, Twitter is one of the most effective social media platform for online communication and to build brand loyalty to your customers and …it’s free! Who doesn’t love free marketing? The number one reason why people shy away from using this social media platform is because the Twitter language can be intimidating and confusing. Twitter is one of those applications that is best learned by using it on a daily basis. Don’t be afraid of what the Twitterverse has to offer. 1. Let’s begin with your Twitter handle. This is your identity, your brand or your alias, whatever you choose it sticks with you – but have no fear, you can change your Twitter handle at any time, but try not to change it often because it will leave your followers confused. It must contain fewer than 15 characters, so keep it nice and short – something that people will remember. Have your photo, location and a catchy bio ready to attract people to start engaging with you. 2. The Timeline. This is your homepage that’s updated every second. It shows the most recent Tweets of who you follow at the top of your page, but have the refresh button ready or else you won’t be able to keep up! 3. The reply “@“ sign – This is to directly tweet [at] someone, simply add the @ symbol in front of a username and begin to have a conversation with them. This is the best way to engage with people. Having the @username at the end of your tweet will show up on the timeline all the people that follow you rather than someone physically going to your page to see the tweet. You can check your mentions at the top of your home page to see who has replied to your tweet. 4. Next is the #hashtag, which is misconstrued by many. A Twitter #hashtag refers to a keyword, topic of discussion or phrase. Often new users think by adding a #hashtag #to #everything #they #tweet is helpful but in reality, it’s not. The best time to use a #hashtag is when there’s an award show, political election or a social issue that’s being discussed at the moment. Check the Worldwide Trends on Twitter periodically to keep up with what’s going on in your city and other countries, this will indeed help you engage with others. The usual topics that make it in the trending topics are politics, celebrities and award shows. Use the #hashtag wisely! Don’t overdo it. 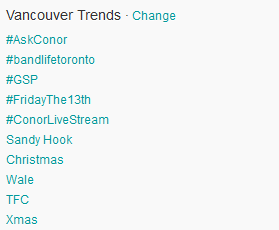 Personally, I enjoy having the “Vancouver Trends” on so I can keep up-to-date what’s going on locally. It’s also the best for local businesses to have their own city trends because then they can engage with local customers and build loyalty. People who search the #Vancouver tag can engage with you and help you out with whatever you’re asking! There are several hashtags that are used on a weekly basis. #FollowFriday (#FF) is one of the very first catchy hashtags created by Twitter and used by millions of users each week. People curate a list of the people that they follow into one tweet, telling other users to follow them. 5.The Retweet, also known as RT for short is probably the most difficult Twitter tool for new users. It’s a tweet that had been forwarded or resent by someone, but it was originally written and sent by someone else. Seems a bit confusing, right? But once you understand the concept, it becomes quite addicting to Retweet the people you follow. Now if someone retweets you, your tweet will be shown on their profile which brings more traffic to your twitter page. 6. Favorite a Tweet. This is probably my most used feature on Twitter. Sometimes you don’t want your twitter page to be overflowed with conversations, it’s best to just “fav” a Tweet to let the person know that you have seen their tweet. It’s respectful and quick. You can always favorite tweets with links in them so that you can come back to it whenever. 7. Direct Message also known as a DM. A direct message is a private message sent on Twitter only to someone who is following you. Twitter has recently added an “attach a photo” in a direct message feature so now you can send photos privately to someone. 8. The # Discover tab. By what you tweet, Twitter will curate an abundance of tweets/photos/trends that are best suitable to you. This is the best way to find more people to follow and engage on topics that interest you. 9. Lists on Twitter. One of the least used features on Twitter, but when it’s used – it’s definitely one of the most effective especially for a business. This is featured on your profile page on the left side. A Twitter list is a curated group of Twitter users organized by what those people have in common. Lists help you organize your followers into categories or groups which saves you a lot of time to catch quality tweets on your timeline. You can have a maximum of 20 lists and up to 500 people on each list. 10. Follow! The easiest feature on Twitter. Follow people who you find interesting and who you want to engage with. Don’t be shy! Plus this is the best way to get people to follow you back and gain followers. Hope your mind is now at ease now that you’ve learned Twitter tips for new users. If you have any questions, comments or tips, post below!